EgyptAir flight MS804 was travelling from Paris to Cairo with 56 passengers and 10 crew members when it ‘disappeared’ early Thursday. Here is what you need to know so far. The majority of the passengers were from Egypt, however there were passengers from 11 other countries on board. 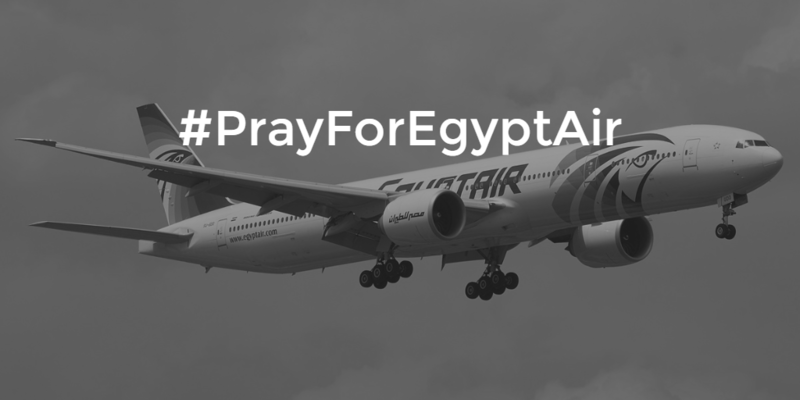 The nationalities included passengers from the following countries, announced EgyptAir: Egypt (30), France (15), Iraq (2), United Kingdom (1), Belgium (1), Kuwait (1), Saudi Arabia (1), Algeria (1) Sudan (1), Chad (1), Portugal (1), and Canada (1). According to state media Al-Ahram, the passengers include the sister-in-law of Hisham el-Maqawad, the deputy to the Egyptian Ambassador in Paris, and Sahar al-Khawaga, a Saudi woman who works at the Saudi Embassy in Cairo. Q: When did the plane disappear? What is the timeline of the flight? EgyptAir flight MS804 took off at 11:09PM (Cairo time) and was scheduled to land at around 3:00AM. According to Greece’s Civil Aviation Department, the passenger plane entered Greek airspace at 01:24AM (Cairo time) and checked in with the air traffic control sector at 01:48AM. At 02:27AM, the air traffic control tried and failed to make contact with flight MS804, despite repeated attempts. At 02:29AM, the plane left Greek airspace and entered Egyptian airspace. Exactly 40 seconds later, at 02:29:40 AM, the aircraft’s signal was lost. Search and rescue operations by Egyptian and Greek forces kicked off at 02:45AM. Q: Have we found anything? Yes. Egypt’s Military announced that it discovered parts of the wreckage from the missing EgyptAir flight MS804 roughly 290 kilometers off the coast of Alexandria. EgyptAir confirmed the news. Q: So did the plane crash? Why? France’s President Francois Hollande confirmed that EgyptAir flight MS804 crashed. However, Egypt’s Minister of Civil Aviation announced that he would continue referring to MS804 as the ‘missing’ plane until debris is found. On social media, many have speculated that terrorism or mechanical failure were responsible. Egyptian, French, and Greek authorities have all warned against making assumptions, stating that anything is possible and that it is too early to tell. Q: Were the pilots experienced? Yes. The pilot of the aircraft had 6,275 hours of flight time, of which 2,101 were on the same model of aircraft, said EgyptAir. The co-pilot had recorded 2,766 hours of flight time. The aircraft was manufactured in 2003 and had approximately 48,000 flight hours. According to the BBC, flight MS804 had flown all around the world in the past week. Destinations included Asmara (Eritrea), Brussels (Belgium), Istanbul (Turkey), Abu Dhabi (United Arab Emirates), Kuwait City (Kuwait), Athens (Greece), Luxor (Egypt), Alexandria (Egypt), Casablanca (Morocco) and Tunis (Tunisia). Q: How should family members get in touch? EgyptAir opened a toll-free hotline for family members to receive information. The hotline numbers are: 080077770000 for any family members using a landline in Egypt and+20225989320 for anyone abroad or in Egypt using a mobile phone. Egypt’s Civil Aviation Minister said that Egypt would host family members of passengers at Charles De Gaulle Airport in Paris and at Cairo International Airport. The Minister offered free tickets to any family members in France who would like to return to Egypt to follow up on the incident.